← She’s Back – In Full Colour! I just wanted to wish all my fantastic followers and guests to my little ol’ blog a Merry Christmas and a very Happy New Year. In the New Year I hope to continue bringing you lots more pictures and updates on my car, even the finished article? You just never know! Not so sure I would want to drive a convertible in the snow – but, what a great picture. 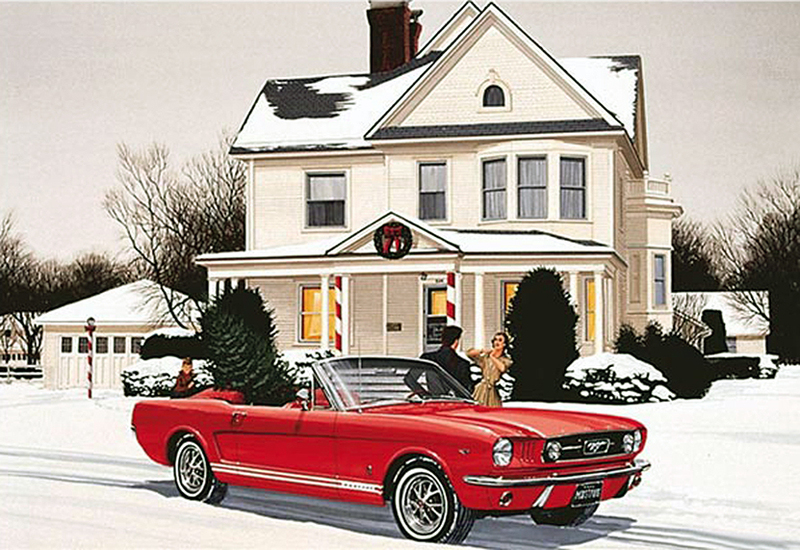 This entry was posted in Blog and tagged christmas, convertible, Mustang, One man and his Mustang. Bookmark the permalink. Christmas has gone so I’ll wish you a very Happy New Year and getting your pride and joy on the road in 2015. Love this nostalgic picture. Merry Christmas and Happy New Year! The background I made, it is just a tile that duplicated by the standard theme. The snow fall is a standard thing by WordPress in the main settings that you can enable or disable just for Christmas, it automatically turns of in a few days, unless I turn it off before of course. It only really works well on dark backgrounds. Now, that’s a great Christmas photo. All the best to you for the holidays. Here’s to you rolling that car out of the garage in 2015.